Willis Cooper (who is the same person as Wyllis Cooper you sometimes see listed with the same biographical facts--he apparently traded the "i" for the "y" in 1940) is a peculiar and fascinating character in the history of American mass media. He probably isn't as well known as a man of his talents should be, but he did leave behind a legacy of high-quality work which enjoyed a cult following. Wyllis Cooper was the writer and creator of the quirky and spooky radio series Quiet Please and Lights Out. He had a knack for puzzling, thought-provoking, disquieting stories of invisible creatures, hallucinations (of talking flowers, for one handy example) and other scary flights of the mind. Wyllis Cooper's macabre imagination was bred in the heart of America--he grew up in a small Illinois town called Pekin. From there it was one of the last places you'd expect a future horror/mystery writer to develop, the U.S. Cavalry. Willis Cooper served in the Signal Corps in WWI, and upon returning stateside, made a very odd transition, the one to work as an advertising copy writer. From there, a gentler switch to radio show writer. In 1934, Wyillis Cooper went to the windy city and creating his howling, suspenseful show Lights Out. The program aired at midnight and created a spare, haunting sound. It was also quite adventurous in terms of the brutal fates to which it subjected its characters. They would boil in a ladle of steel or devoured by a giant amoeba. Cooper left the show in 1936, but it lived on. In fact, the program actually used some of his old, unproduced scripts after he departed. He spent times on both coasts doing some screenwriting. 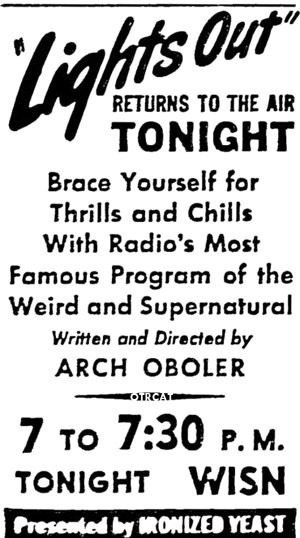 But in 1947, he dipped back into his earlier medium, radio, creating another horror and supernatural show, Quiet Please. Like Lights Out, everything about it was quiet in a nearly menacing way. Cooper's brilliant scripts were narrated by Earnest Chappel, a former game show announcer who affected a truly creepy demeanor with his dull, gravelly delivery. The uncompromising nature of Cooper's commitment to mind-bending, truly affecting science fiction ensured that his programs would win over listeners and draw critical acclaim. 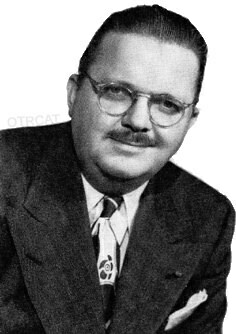 Cooper was born at the right time, developing as a writer in the days when sound effects and appeals to the sense of hearing were paramount, due to radio's dominance. He did write for television and films, but we love him for his pioneering radio work, which you can now enjoy this comprehensive collection. See also: Arch Oboler Collection. His series #quiet please# is the greatest fantasy series.